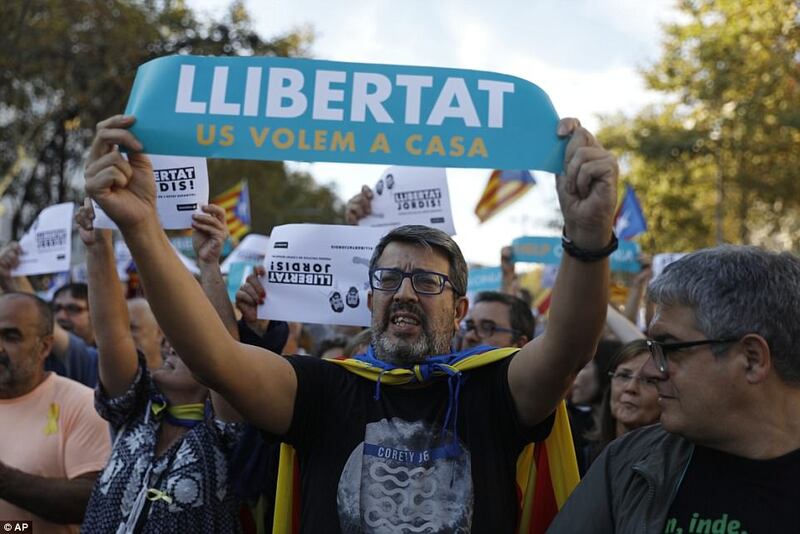 Thousands of pro-independence campaigners carried banners saying Llibertat - freedom - during the lively protests which began earlier today and carried on into this evening. 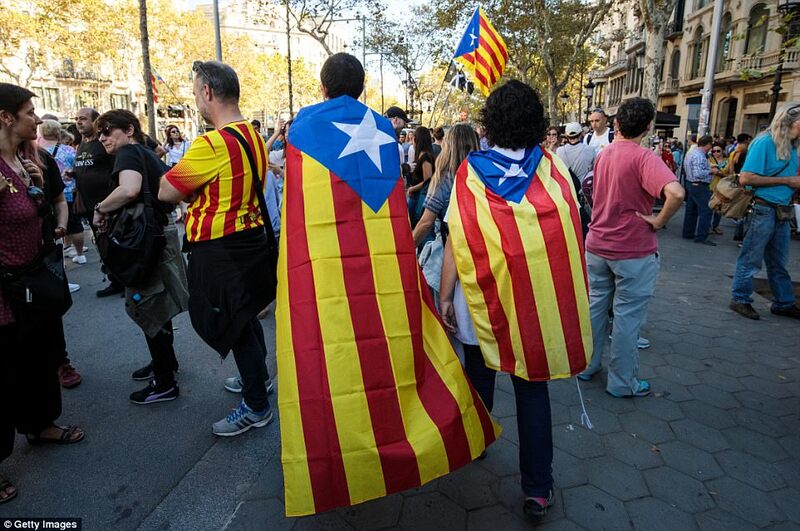 Catalonia was an independent region on the Iberian Peninsula with its own laws and customs until the reign of King Philip V, who defeated the Catalans in battle and created modern-day Spain. 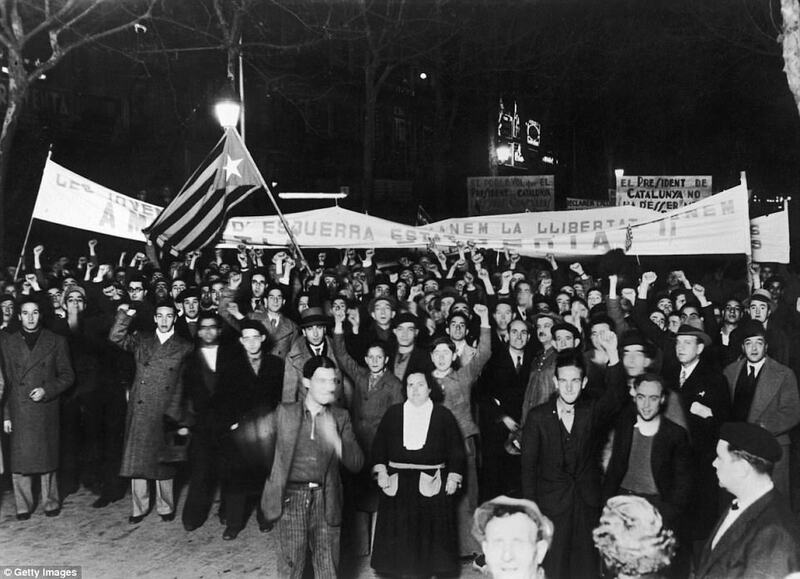 Subsequent Spanish kings tried to impose Spanish laws and language on the region, but abandoned their attempts in 1931 and restored the Catalan government. The region lost autonomy in the wake of the Civil War after fascist dictator Francisco Franco won the Battle of Ebro in 1938. 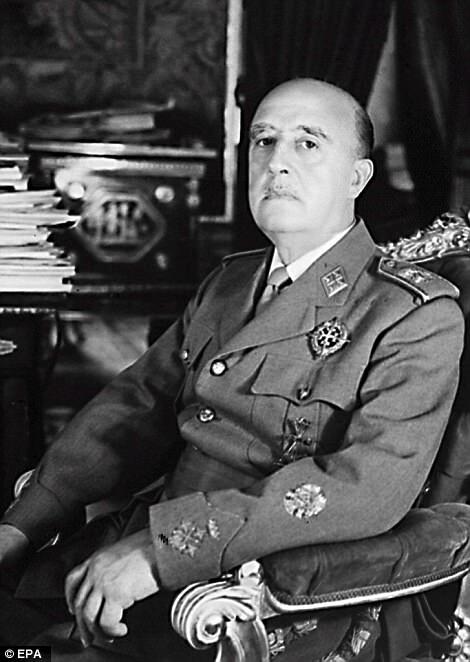 He seized control of the Catalan government, abolished the language and killed 3,500 people after nearly half a million died in the brutal Civil War. 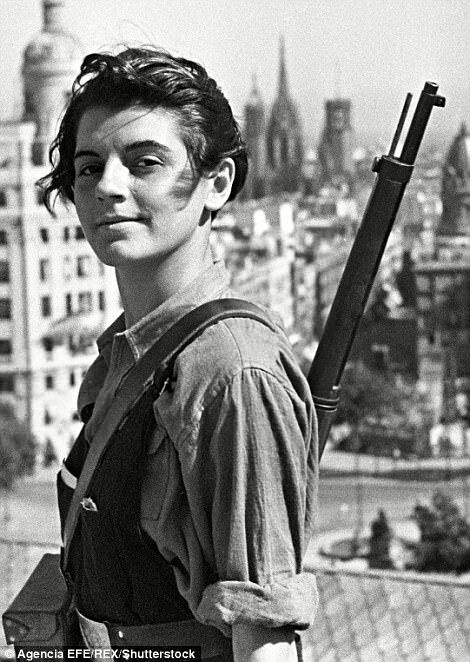 The region regained some autonomy after Franco died in 1975, but for many this was not enough. 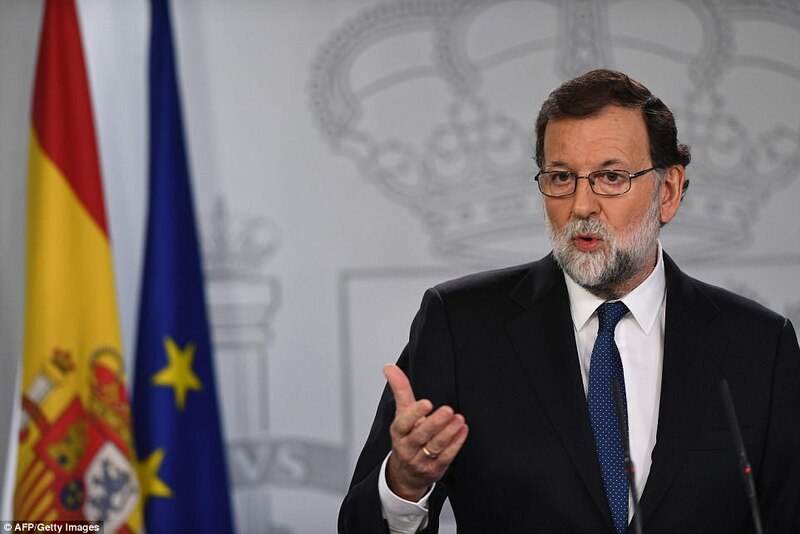 Mr Rajoy said his government had taken the unprecedented decision to restore the law, ensure regional institutions were neutral and guarantee public services. 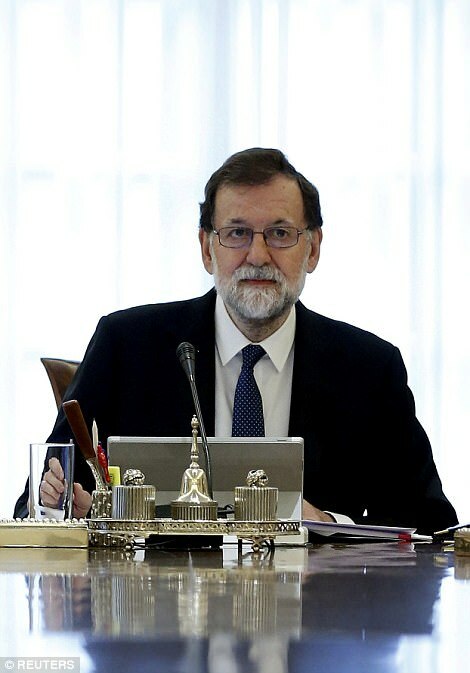 Mr Rajoy's conservative Popular Party holds a majority in the Senate, and the measures also enjoy the support of the main opposition Socialists and centrist Ciudadanos party. 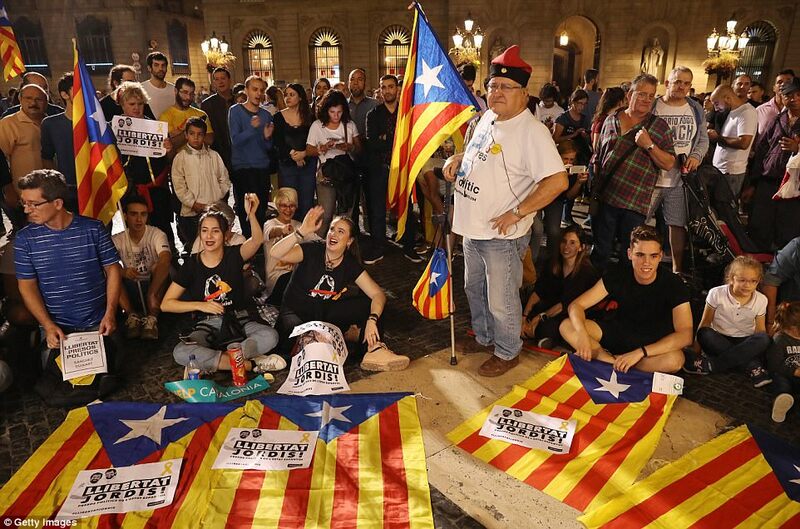 If the Senate passes the proposals, the Catalan parliament will continue to operate as normal until it is dissolved. 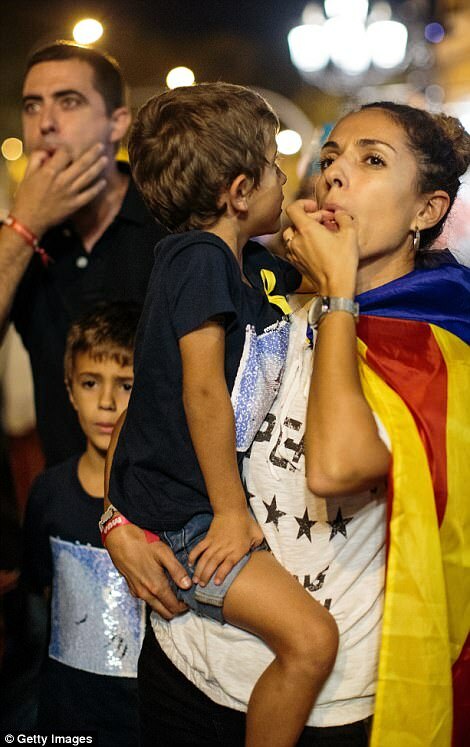 However, it will be unable to elect a new president to replace Mr Puigdemont or vote on any laws that go against Spain's constitution and its statute as a semi-autonomous region. 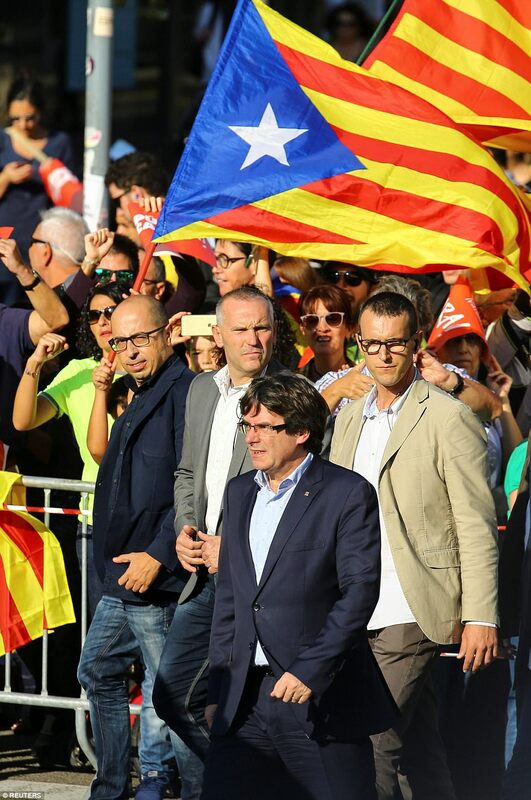 Catalonia leader Carles Puigdemont joined the protest in Barcelona this afternoon before delivering a speech in response to the decision to take over the regional cabinet's functions at 9pm tonight. 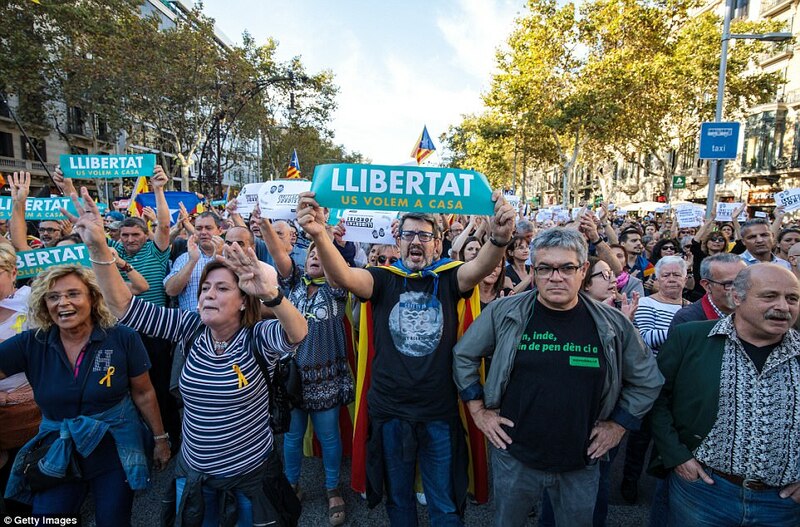 Independence campaigners are also angry about the imprisonment of activists Jordi Sánchez and Jordi Cuixart, who were both leading figures in the October 1 referendum. 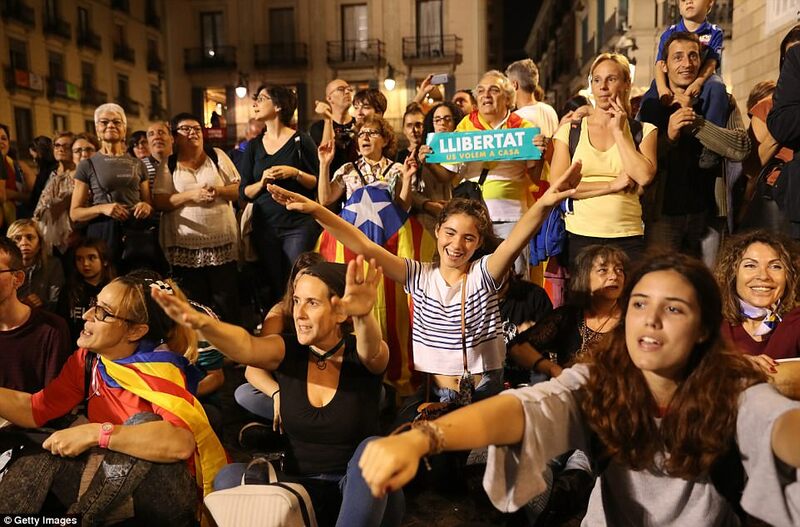 The speaker of the Catalan parliament said the Spanish government had made an effective 'coup d'etat' in what she called an 'authoritarian' attempt to take control of the northeastern region. 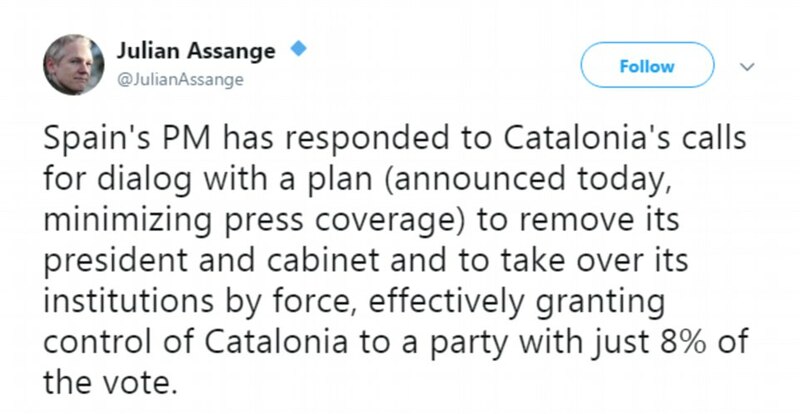 Mr Rajoy is also requesting that Puigdemont's government be stripped of its power. During this 'exceptional situation', ministers from the central Spanish government would carry out the roles previously occupied by Catalans. 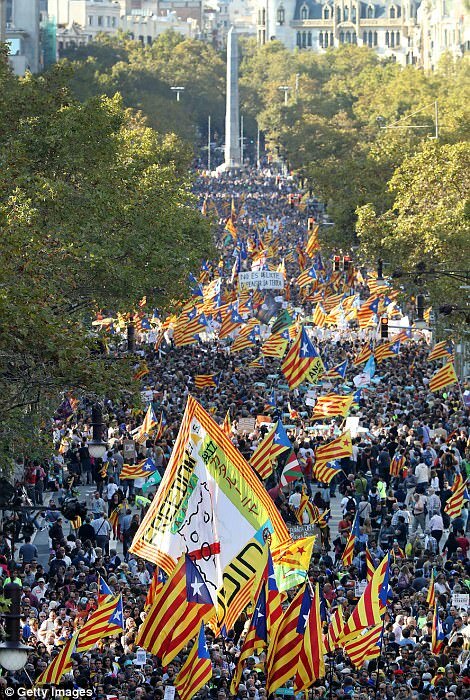 The Prime Minister confirmed Spain was initiating Article 155 of the Spanish Constitution in order to take control of Catalonia. 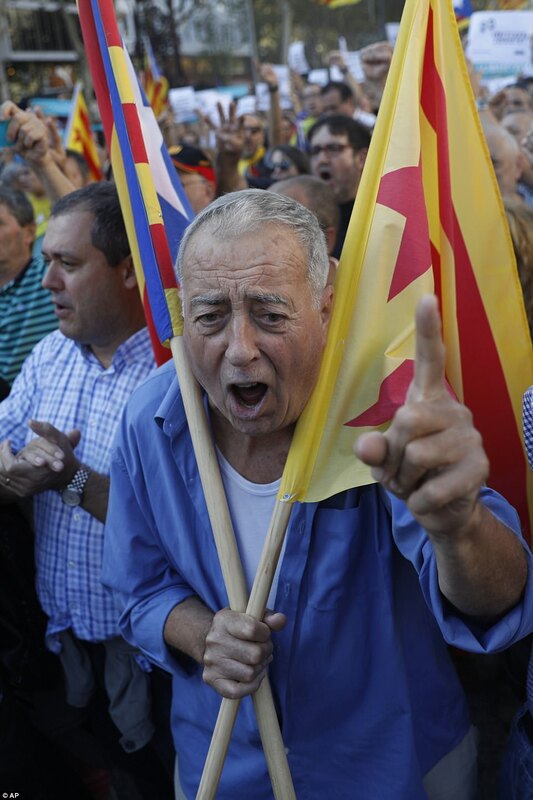 He blamed separatists for pushing the government to take the unprecedented measures in Catalonia, which have caused anger even among moderates. 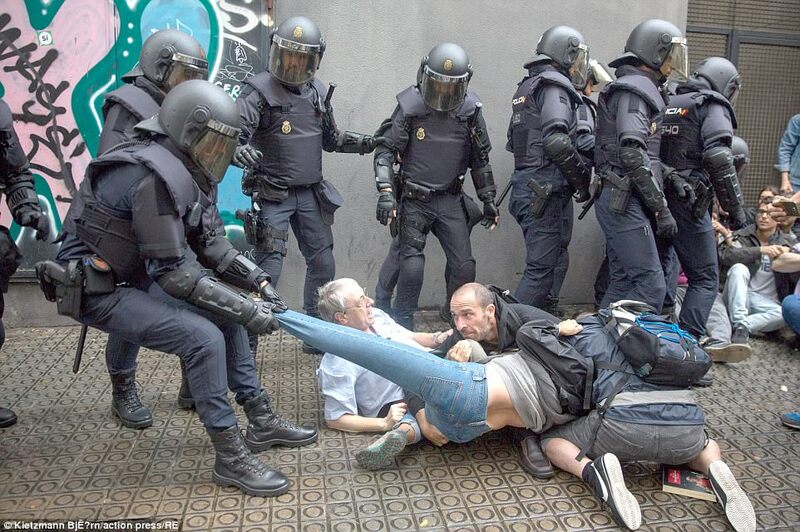 Meanwhile, Spanish authorities are preparing to arrest Catalonia's president and charge him with rebellion if he declares independence. 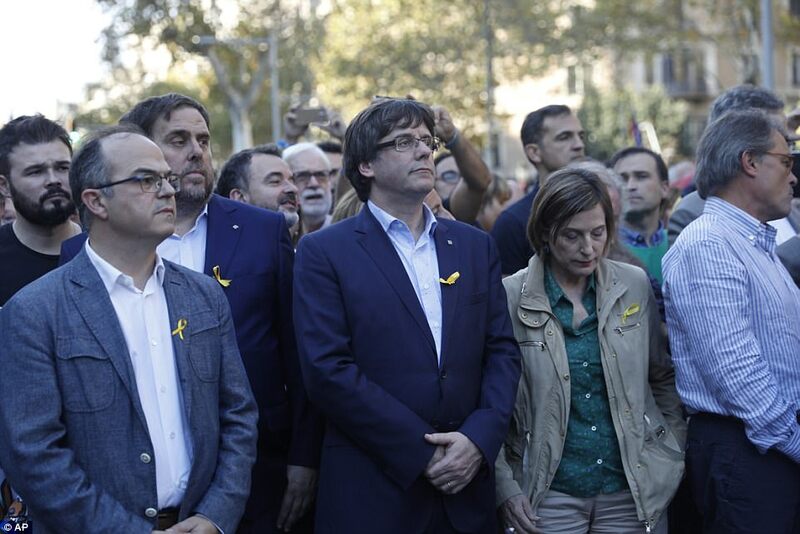 The State Attorney General José Manuel Maza confirmed 'a complaint is being prepared for rebellion' against the President of the Generalitat of Catalonia, Carles Puigdemont, and other independence leaders. 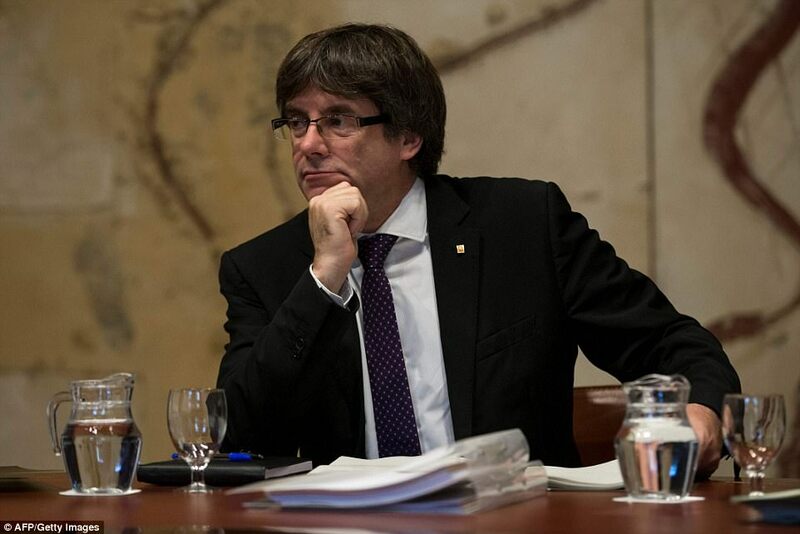 The charge of rebellion could see Puigdemont face up to 30 years in prison if found guilty, according to El Pais. 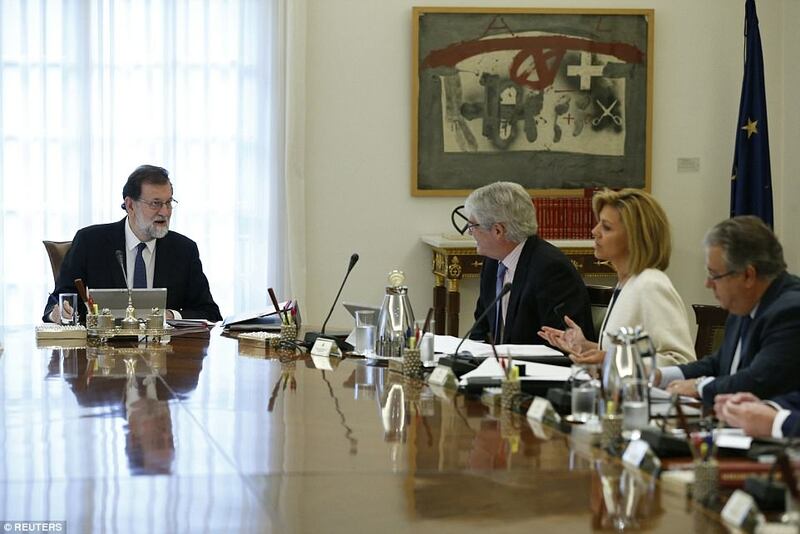 During the earlier press conference, Rajoy said: 'It wasn't our wish, nor our intention. 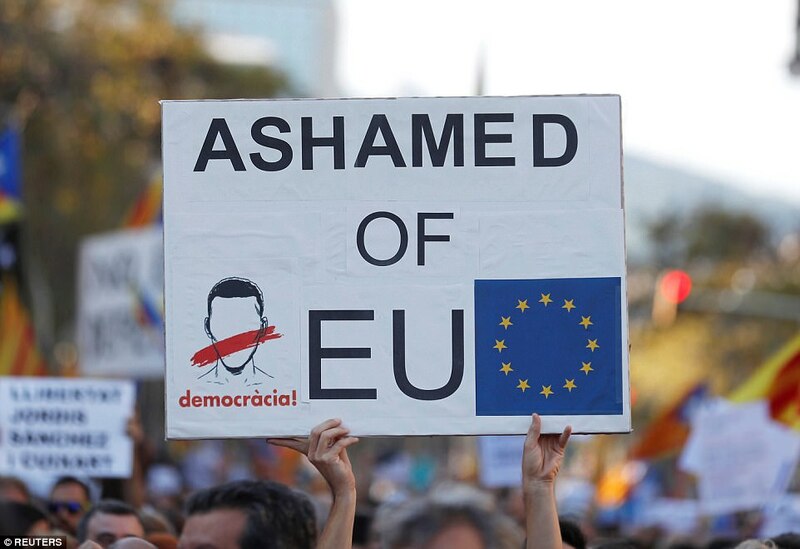 It never was and I think the Spanish public opinion as a whole knows this. 'Article 155 is a constitutional article, but it's only invoked in exceptional circumstances. In the streets of Barcelona, banging pots and pans and honking cars greeted Mr Rajoy's announcement. 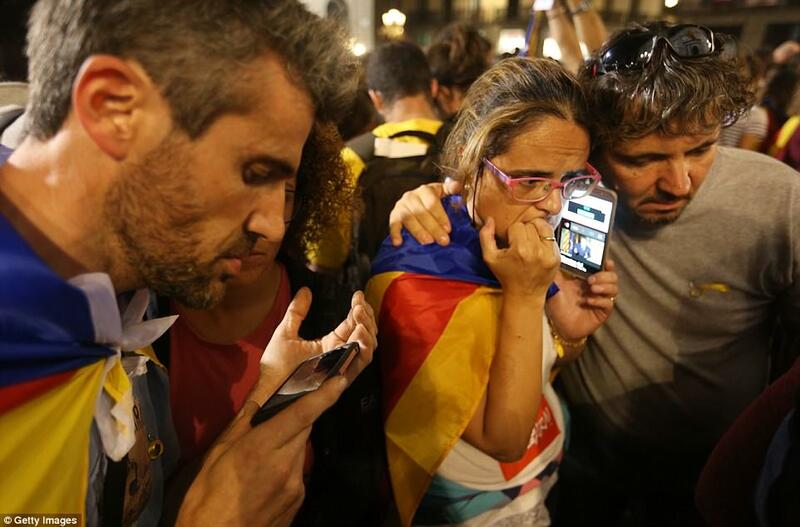 The tense relations between Barcelona and Madrid led one EU official to controversially claim that a 'civil war' was 'imaginable'. At the national level, Pablo Echenique, a secretary in the far-left Podemos party, vowed to work to oust Mr Rajoy and his conservative Popular Party. Pro-business Ciudadanos (Citizens) party president Albert Rivera says he supports measures to heal divisions created by the independence movement and to provide the security companies need to remain in Catalonia. 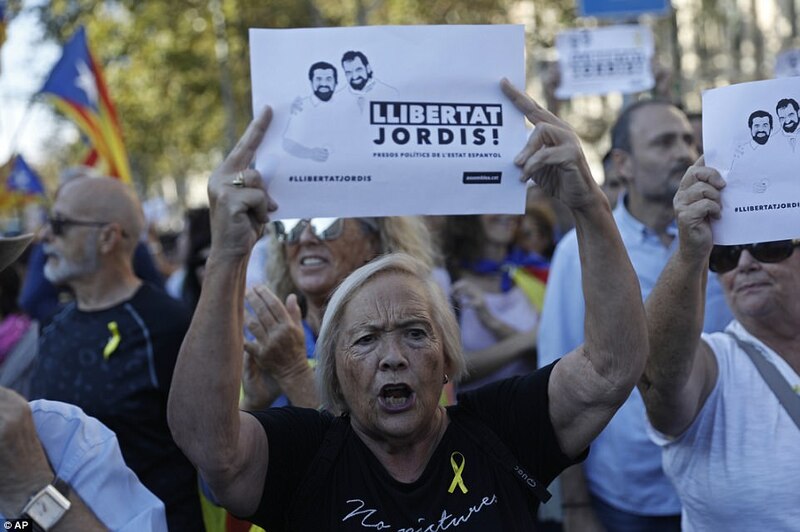 Marta Rovira, the general secretary of the Junqueras' separatist ERC party, said Prime Minister Mariano Rajoy's actions are a 'coup d'etat' designed to crush Catalonia's self-rule and aspirations of breaking away from Spain. 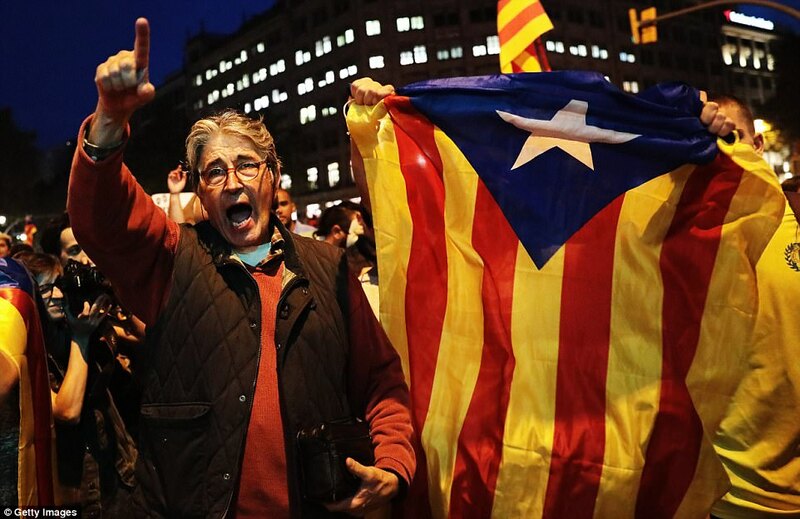 Barcelona Mayor Ada Colau has opposed a declaration of independence in Catalonia based on an the referendum that Spain's Constitutional Court had suspended. 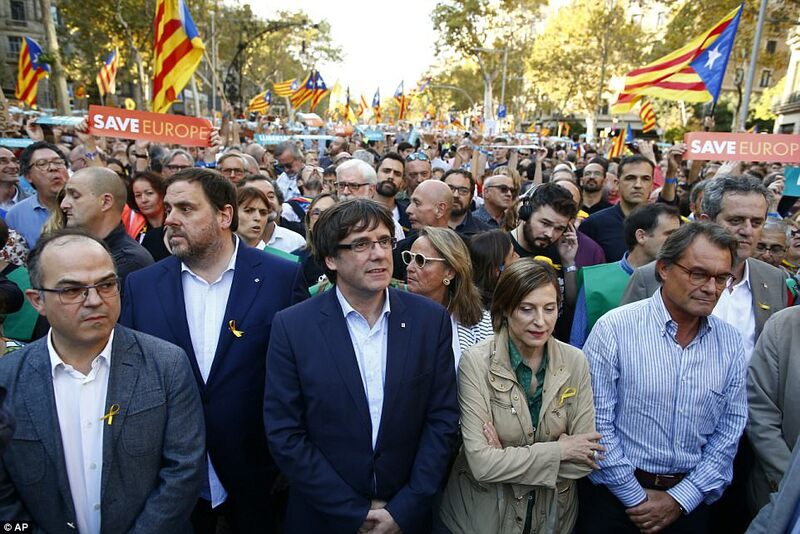 Colau nonetheless criticized the central government on Saturday and called its moves 'a serious attack' on Catalonia's regional autonomy. 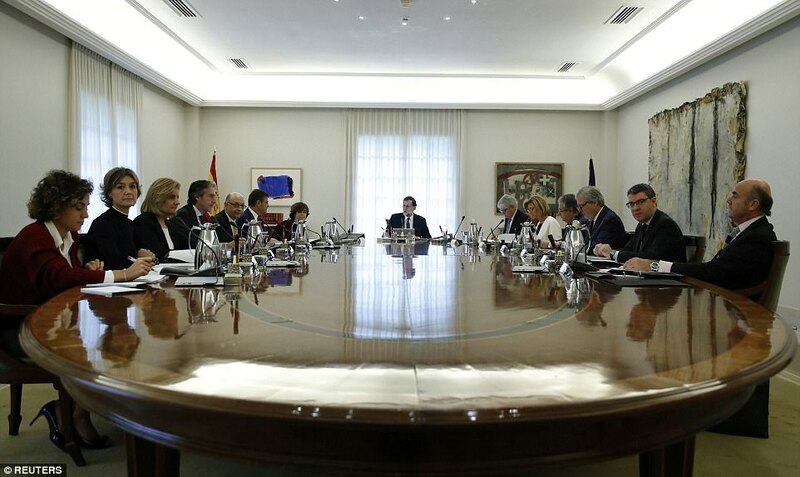 Earlier, Prime Minister Mariano Rajoy's Cabinet met to outline the scope and timing of the measures the government plans to take under Article 155 of the Spanish Constitution. 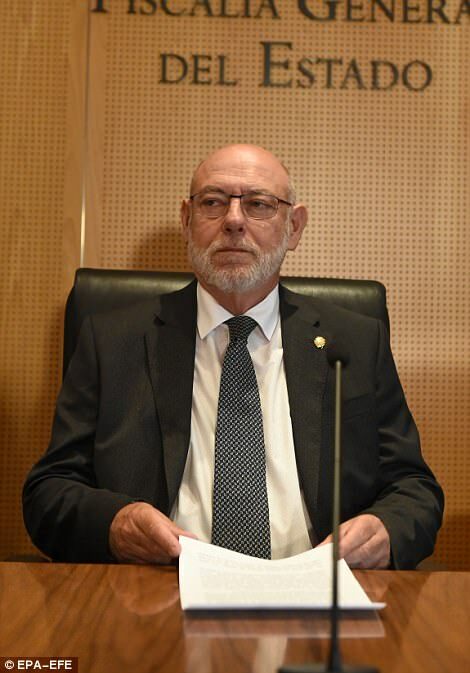 The article allows central authorities to intervene when one of Spain's 17 autonomous regions fails to comply with the law. 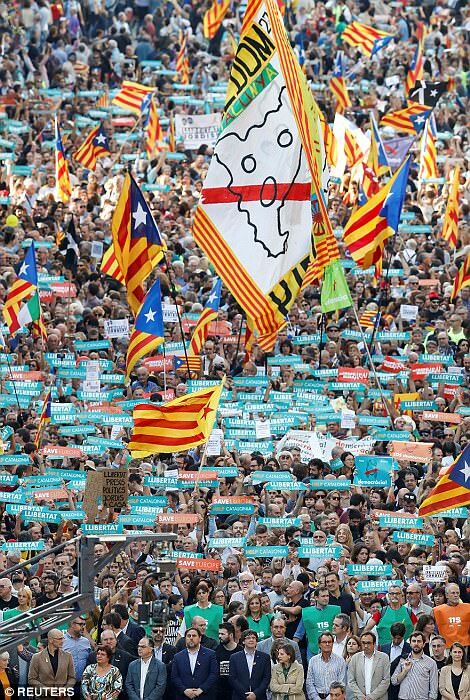 It's never been used since the 1978 Constitution was adopted, but Rajoy's conservative government says establishing direct control over Catalonia was a move of last resort. The goal is 'the return to legality and the recovery of institutional normalcy,' the prime minister said Friday. 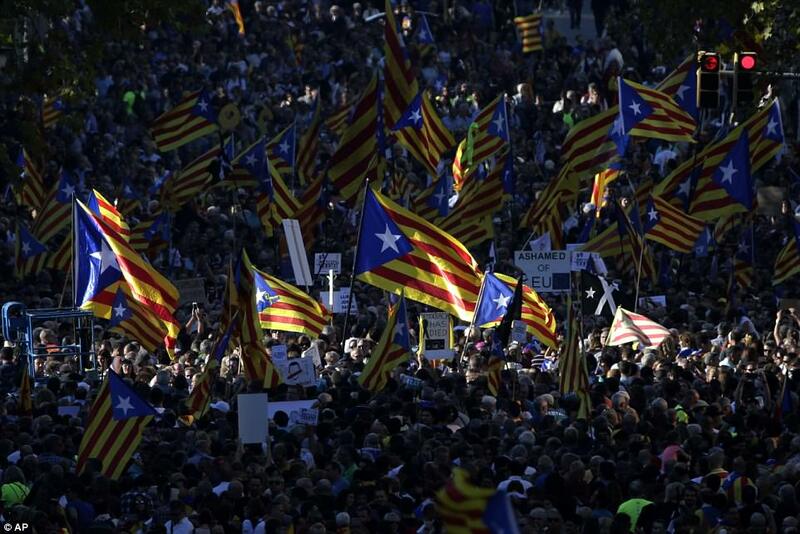 Rajoy could force the removal of Catalan officials and call early regional elections for as soon as January. 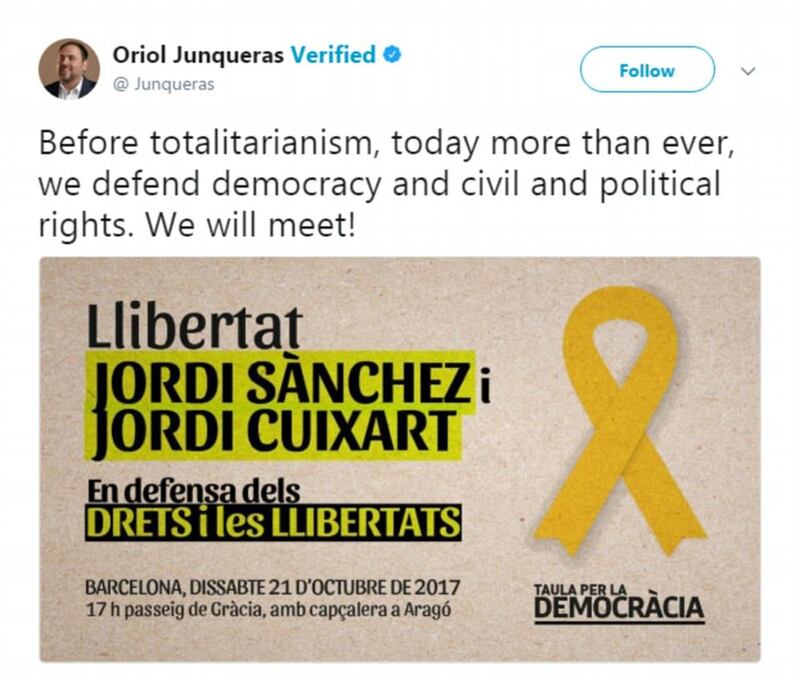 Such actions are expected to spark angry opposition from supporters of independence and moderate Catalans who will see them as an attack on their autonomy. 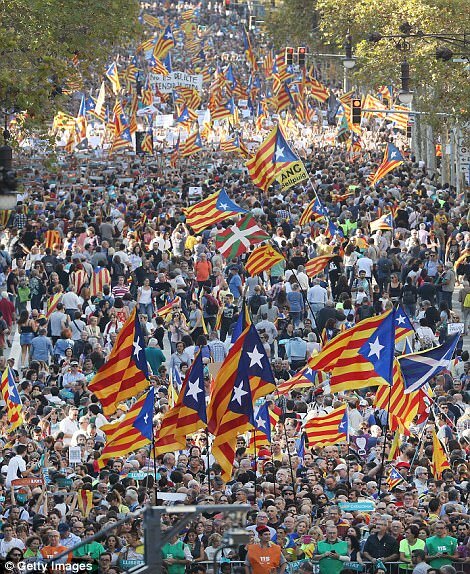 The slow-burning constitutional crisis over secession escalated this month when regional government officials claimed a disputed independence referendum held Oct. 1 gave them a legal basis for separating from Spain. 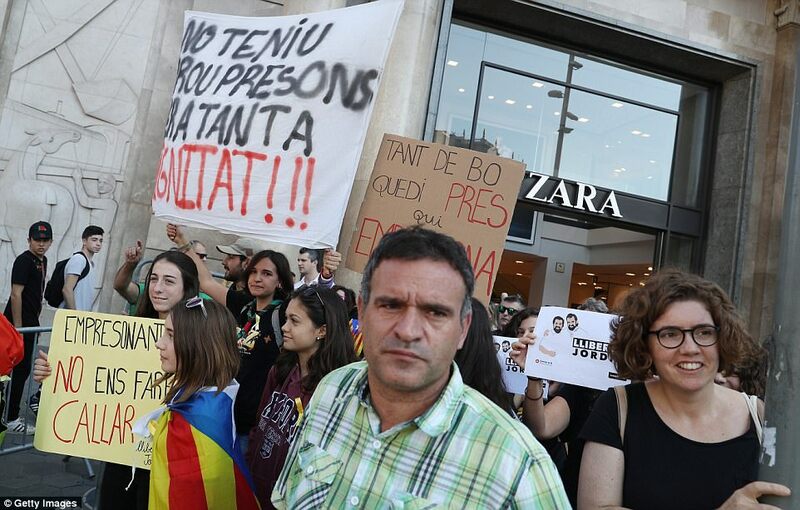 The country's Constitutional Court has so far ruled against all moves toward secession, including the controversial referendum. The vote itself was marred by sporadic violence as police took action to shut down some polling locations. The central government says the results have no legitimacy. 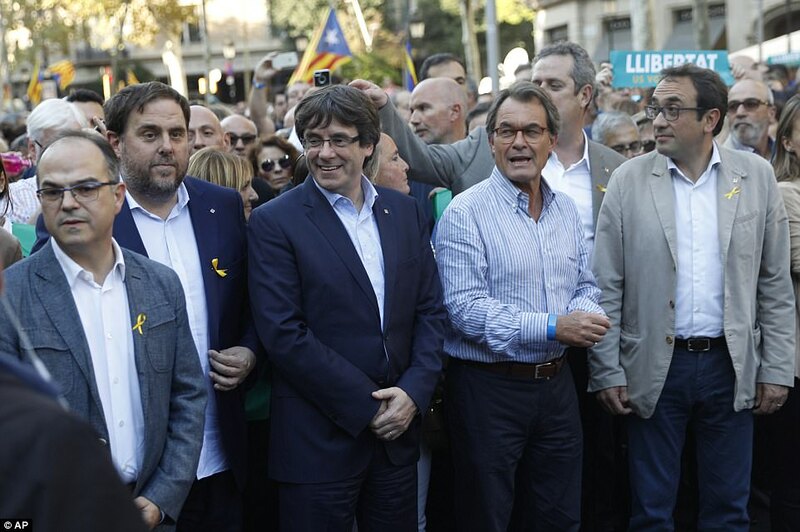 Opposition parties have agreed to support the prime minister in revoking Catalonia's autonomy as a way to thwart the independence drive. 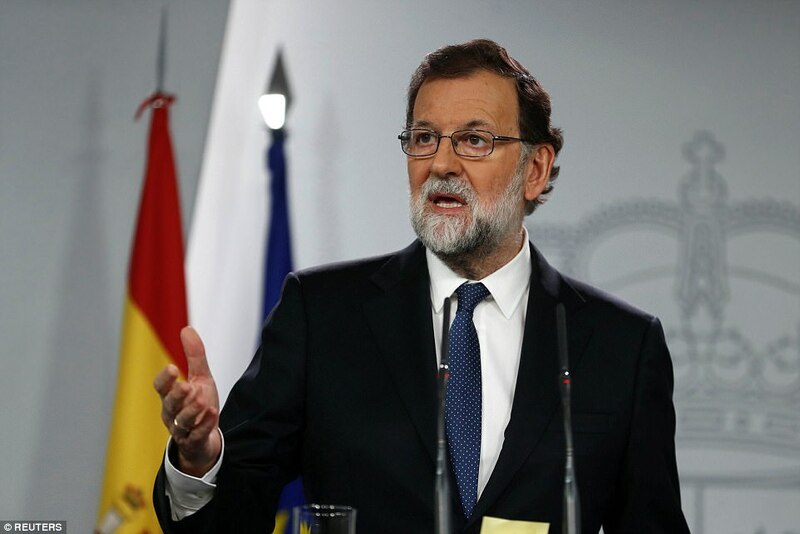 Although the ruling Popular Party has enough majority to get the specific measures passed by the country's Senate, Rajoy has rallied the support of the opposition to give his government's actions more weight. 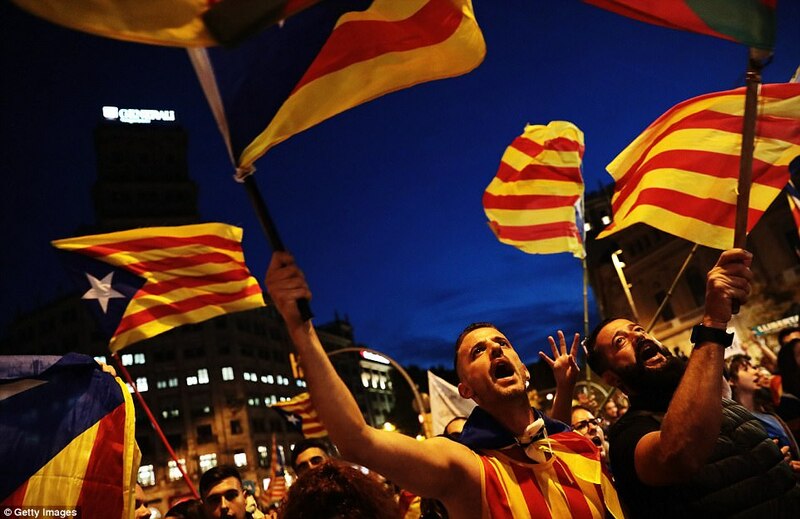 WHY DOES CATALONIA WANT INDEPENDENCE... AND HOW CAN THE REGION BREAK AWAY FROM SPAIN? 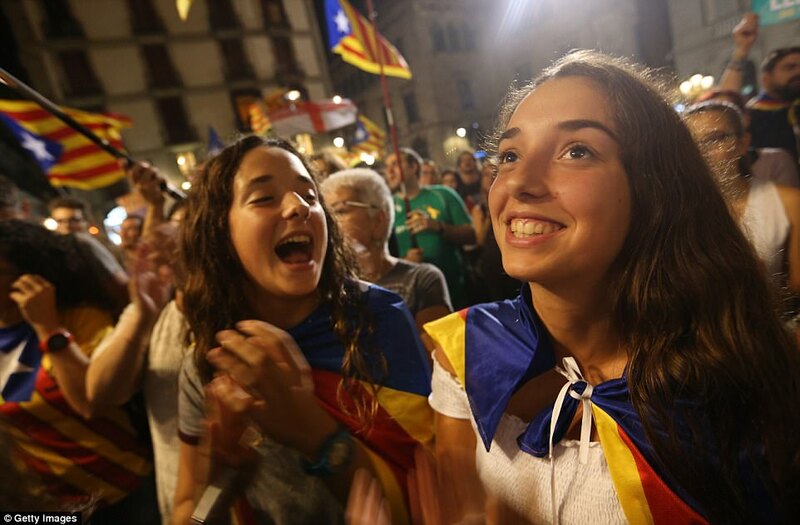 Catalonia, home to 7.5million in the north-east, has its own language, culture and traditions, and many who live there see themselves as Catalan, not Spanish. 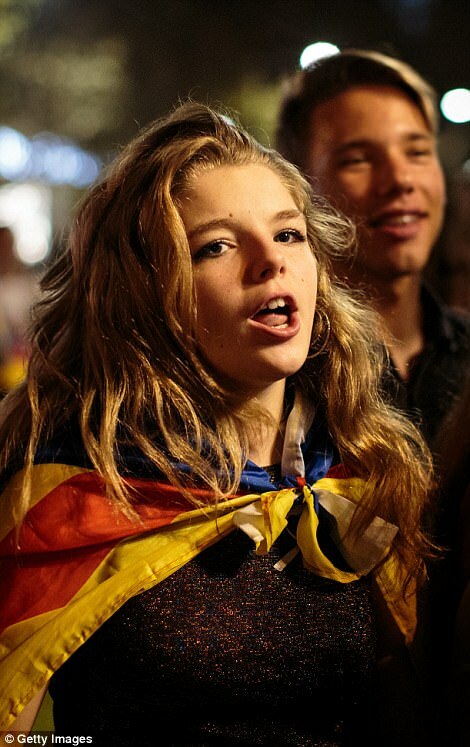 It lost its autonomy in the wake of the Civil War under Francisco Franco, and among other things, the population was banned from speaking Catalan. 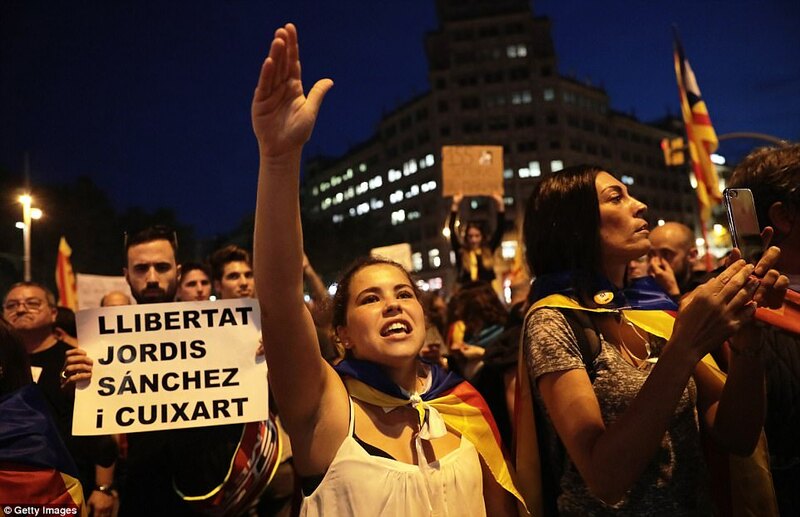 It regained some autonomy after Franco died in 1975, but for many this was not enough. 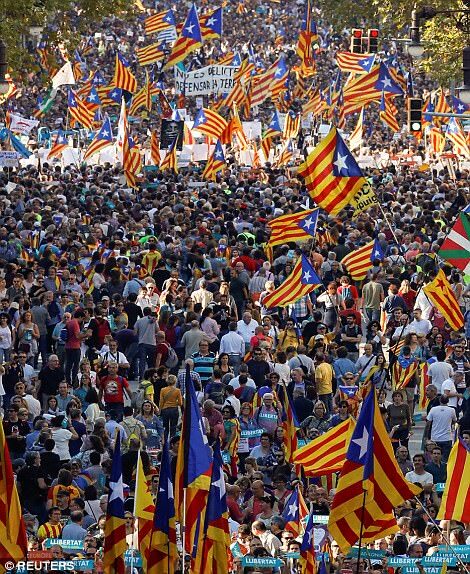 DO ALL CATALANS WANT INDEPENDENCE? 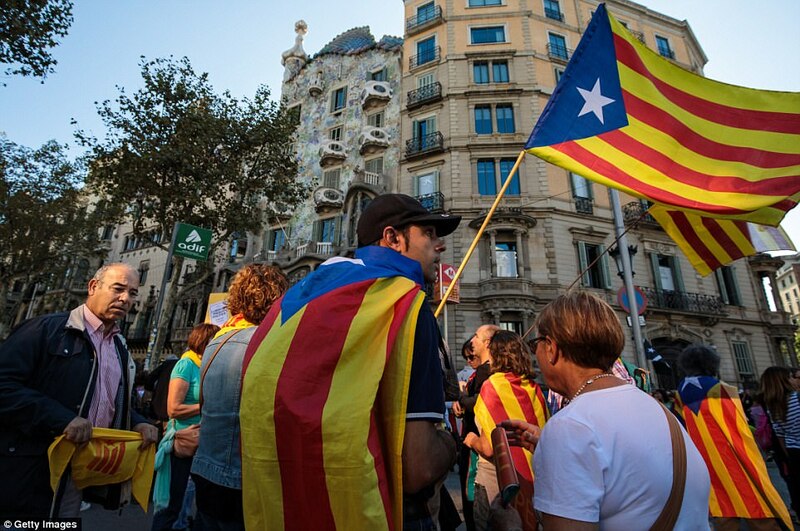 Catalonia is Spain's most prosperous region, and in the wake of the 2008-2016 financial crisis, support for independence has been growing, but low turnouts have skewed polls. An informal referendum in 2014 saw 81 per cent support independence, but just over 40 per cent came out to vote. A 2017 poll by Centre for Opinion Studies found that 49.4 per cent was against independence, and just 41.4 per cent was in favour. The result on Sunday was 90 per cent in favour, but just 42 per cent of eligible voters took part and it is thought most of those who are against independence stayed at home. HOW CAN THEY BECOME INDEPENDENT? 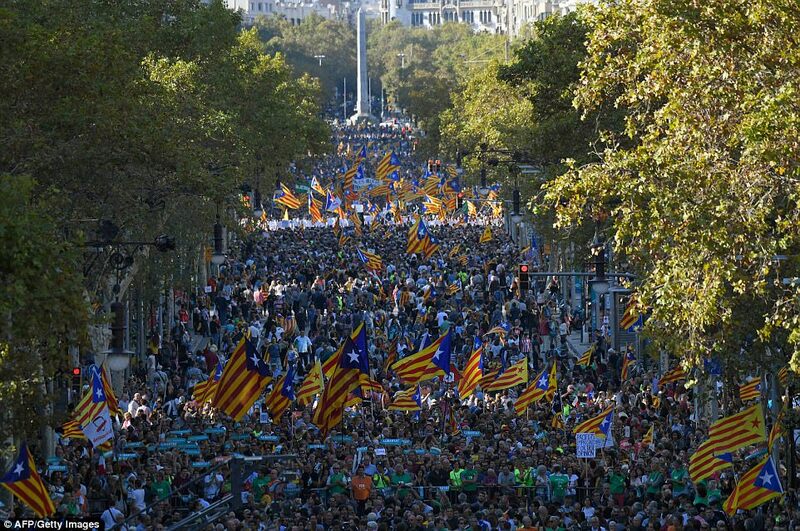 The legitimate and recognised way would be a referendum acknowledged by the Spanish government. 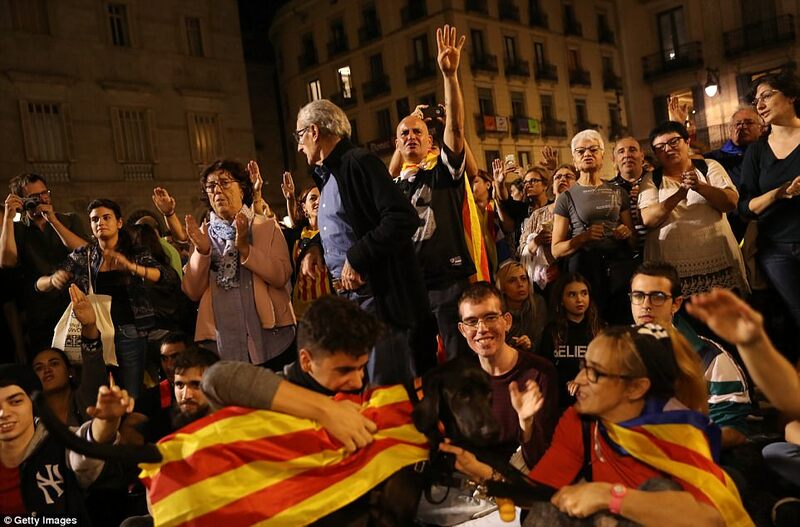 The Catalan regional government claims Sunday's vote was legitimate and so is expected to declare independence in a vote next week. However, it must be recognised as an independent country and - so far - no country or international body has expressed any support for this. 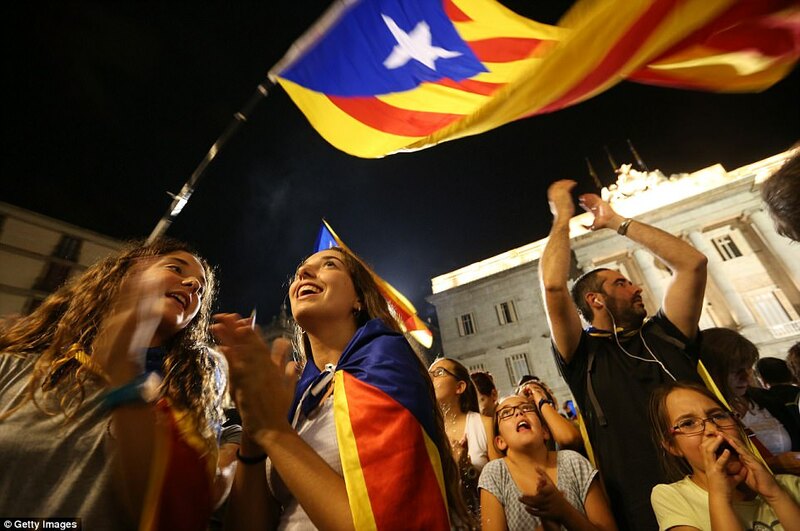 In addition, The EU is standing solidly behind Spanish Prime Minister Mariano Rajoy and says Catalonia would be expelled from the bloc and the shared euro currency. WHAT CAN SPAIN DO TO STOP IT? 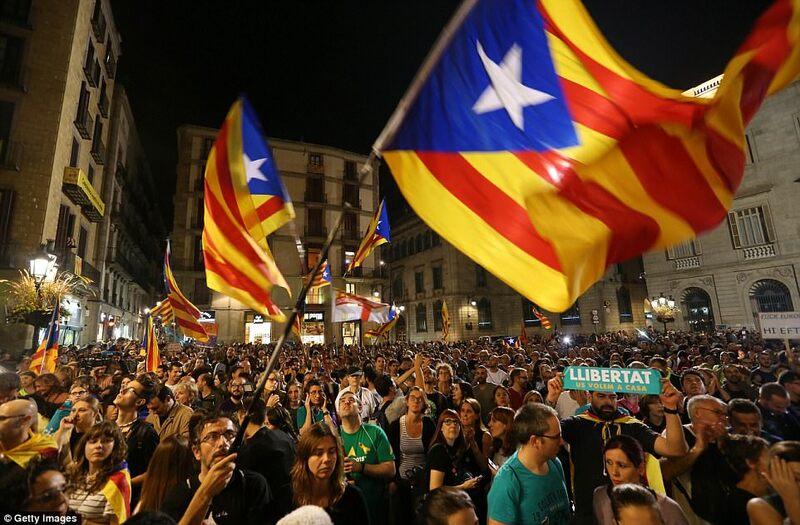 Spain has declared the referendum illegal and invalid, and while Catalonia is autonomous, it is still a part of the country and must obey its constitution. 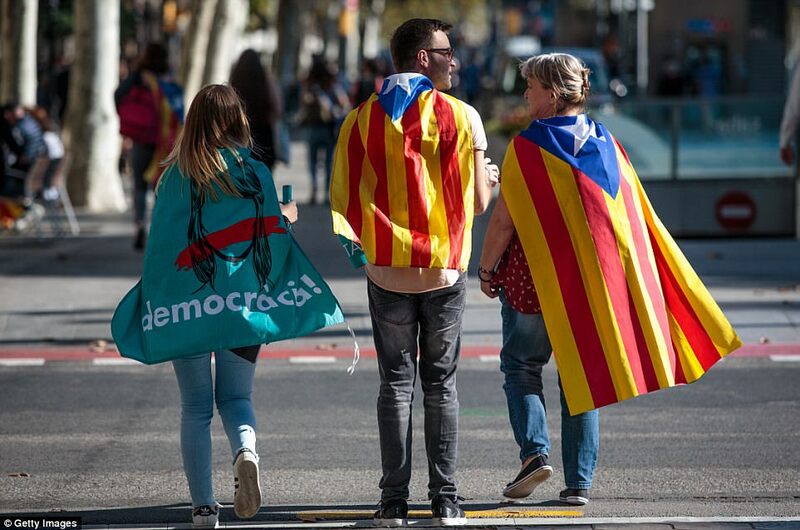 The government can invoke the constitution's Article 155, which allows the government to suspend, totally or partially, any region's self-government if it disobeys its constitutional obligations or attacks the general interests of Spain. 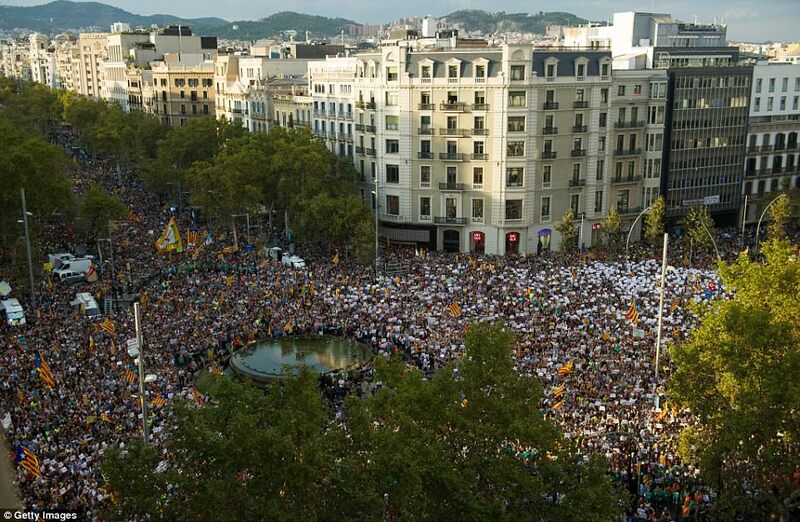 However if the government does not make an effort to try to appease Catalan separatists - or removes Catalonia's autonomy - it is inevitably going to trigger massive protests and strikes in a time where tensions are already at its highest since the end of Franco's reign, and the Spanish economy is still recovering from it's 'Great Recession'. SO WHAT WILL ACTUALLY HAPPEN NOW? Both sides say they are open to dialogue - but have put up conditions unacceptable to the other. 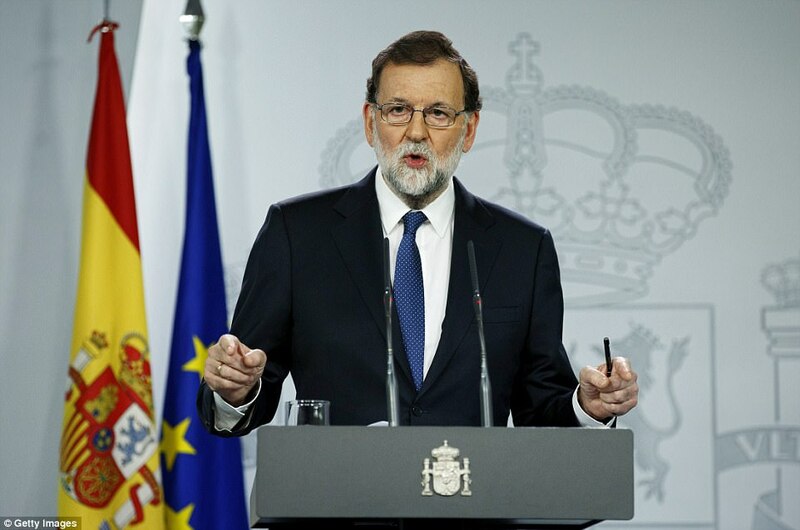 Prime Minister Rajoy had insisted he couldn't discuss a referendum unless the constitution was changed, and invited Catalonia to work on changing it. 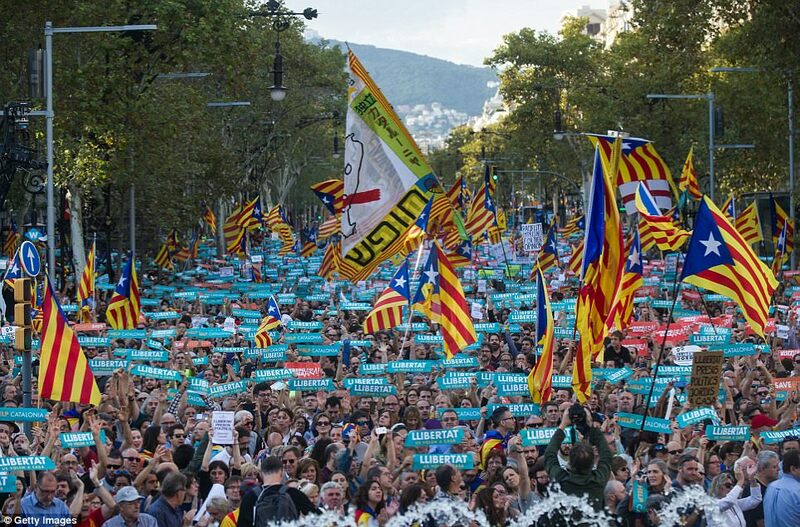 The Catalan government said its right to choose whether or not they want to be part of Spain must be respected first before talks could proceed. 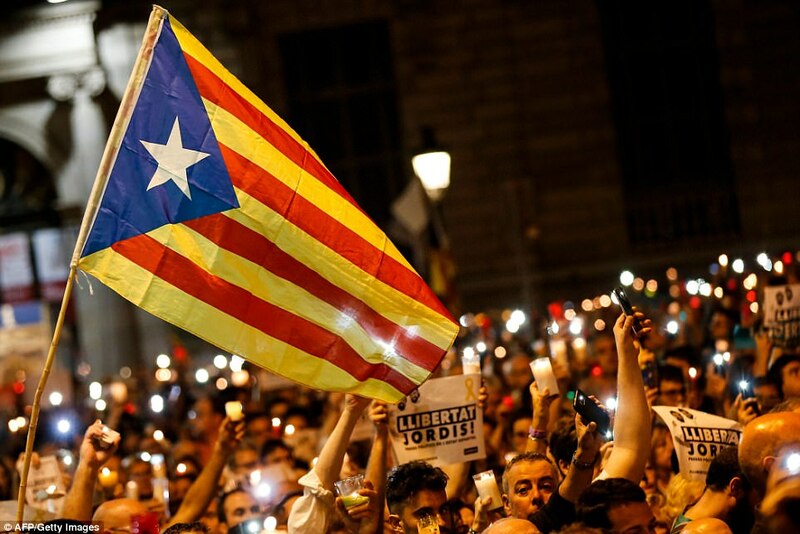 Catalonia now wants the EU to intervene, an unlikely prospect, and calls for international mediation, something Spain is not likely to agree to.